A lot of people thought 2016 was one of the worst years – here’s a quick visual recap of what happened. WHEN WE HEAR of news stories from every corner of the world, it can be difficult to put ourselves in other’s shoes. Sometimes the best way to understand what others are going through is through images. So we’ve picked out some of the most striking imagery from this year that gives us an insight into what happened in 2016. Men wrapped in thermal blankets wait to get on board a ferry bound to Piraeus, at the port of Mytilene, on the Greek island of Lesbos. Undeterred by the bitter cold and the rough winter seas, migrants risk the journey to Greece in the hope of a better future in Europe – most of them are Syrian refugees escaping the civil war. People holding a banner reading “I am Brussels” behind flowers and candles to mourn for the victims at Place de la Bourse in the centre of Brussels. Bombs exploded at the Brussels airport and one of the city’s metro stations, killing 32 people and injuring more than 300 others. The attack was claimed by Isis, making it one of the most deadly acts of terrorism in Belgian history, and three national days of mourning were announced. A horse grazes amid fumigation fog, released to kill Aedes Aegypti mosquitos in an attempt to prevent the spread of the Zika virus. The spread of the disease in South America (with some cases cited in the United States), led to warnings for pregnant women, or those who are at risk of becoming pregnant, to think twice before travelling. It also caused quite a stir ahead of the Rio Olympic Games, prompting some athletes, Rory McIlroy included, not to compete this year. In this picture, the Palmyra citadel is seen in the background as Syrian families load their belongings onto a bus in the town of Palmyra in the central Homs province, Syria. Thousands of residents of this ancient town who fled Islamic State rule returned briefly to check on their homes and salvage what they can – some carpets, blankets, a fridge or a few family mementos. Evacuees watch the wildfire near Fort McMurray, after the Canadian state of Alberta declared a state of emergency and evacuated homes of some 80,000 residents. The gigantic flames swept across 1.5 million acres for two months before it was declared as under control by authorities. It’s the costliest disaster in Canadian history. Candles, gay pride flags and flowers adorn a memorial for victims of the Stonewall riots, following a vigil and memorial for victims of the Orlando nightclub shooting near the historic Stonewall Inn, a gay bar. 29-year-old Omar Mateen opened fire on a crowd in the nightclub Pulse, killing 49 people in what has been called the worst mass shooting in modern US history. This picture sums it all up really – Brexit advocate Boris Johnson suspended (quite uncomfortably) in the air next to the London eye, clutching two British flags. To date, not much has changed. On 23 June British citizens voted to leave the European Union – and will become the first country to do so. This sparked a lot of questions over the future of the EU, the future of the United Kingdom, and the future of democracy itself – as there was some speculation that people had been ‘sold a lie’ and didn’t fully understand what they were voting for. A demonstrator protesting the fatal shooting of Alton Sterling is detained by law enforcement in Baton Rouge, Louisiana. On 5 July, Sterling was shot by police officers several times while being held on the ground outside a convenience store. The incident was caught on video and sparked numerous protests, but this photo emphasises the peaceful nature of most organised protests – contrasted with the armed and padded civil police. Barack Obama has spent his last year in office presiding over huge protests lamenting the many incidents where police officers make the decision to shoot civilian suspects based on the colour of their skin. People gather at a makeshift memorial to honour the victims of an attack on a crowd watching the fireworks in Nice, southern France. A large truck mowed through revelers gathered for Bastille Day, killing more than 80 people and sending people fleeing into the sea as it bore down for more than a mile along the Riviera city’s famed waterfront promenade. A tourist looks at quote by Cuban Revolution leader Fidel Castro explaining in Spanish, ‘Why we say homeland or death,” on a wall at the entrance of a landmark private restaurant in Havana, Cuba. In the run-up to his 90th birthday in August, appreciation for Fidel Castro’s legacy surged and was used by Cubans who sought to maintain Communist values in the face of mounting pressures to loosen control. This year saw Cuba opening up its borders after historic talks with President Obama, and in November of this year, Castro passed away, leading to further debate around the influential leader’s legacy. Pro-government supporters, waving Turkish flags, protest on the road leading to Istanbul’s iconic Bosporus Bridge. In the wake of a failed attempt by the military to take power from Turkey’s President Recep Tayyip Erdogan, the president reacted in the months that followed by increasing powers for himself, cracking down on outspoken figures in Turkey resulting in mass arrests; jailing journalists and shutting down media organisations and schools. 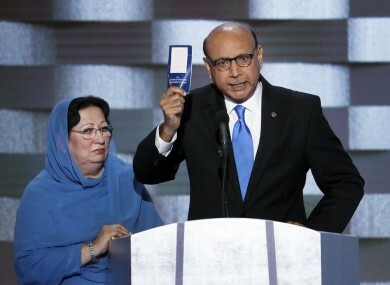 The father of a soldier killed while overseas as part of a US mission offered the then presidential nominee Donald Trump his copy of the American constitution in a powerful speech on what it means to be an American citizen. Cape Verde Islands’ Elyane Boal performs during the rhythmic gymnastics individual all-around qualifications at the 2016 Summer Olympics in Rio de Janeiro, Brazil. This year’s Olympics had all sorts of bodies twisting and turning to come out on top as the winner. Ireland had a mixed Olympic Games – with no medals from our boxing contenders despite high hopes, but the O’Donovan brothers and Annalise Murphy bringing home silverware from their respective water sports. A malnourished child receives health care at a feeding centre run by Doctors Without Borders in Maiduguri. Children who escaped Boko Haram’s Islamic insurgency now are dying of starvation in refugee camps in northeastern Nigeria’s largest city – putting the country on the brink of a famine, according to aid agencies. In October, Boko Haram released 21 of the missing 200 schoolgirls back to their families, with some of the girls returning as mothers. Rebels of the 32nd Front of the Revolutionary Armed Forces of Colombia, or FARC, sit in a boat as they patrol the Mecaya river in the southern jungles of Putumayo, Colombia. As the country’s half-century conflict winds down, and with a peace deal newly-approved, thousands of rebels are emerging from their hideouts and preparing for a life without arms. An elderly man stands on the rubble of Alsonidar Group’s water pumps and pipes factory after it was hit by Saudi-led airstrikes in Sanaa. A vicious but relatively unreported civil war has been going on between President Hadi’s government forces (aided by the Americans) and Huthi rebels. The conflict has killed more than 6,700 people – almost two-thirds of them are civilians. A woman washes the cord used by fishing boats, in the polluted shoreline of the Philanthrope neighbourhood of Les Cayes, Haiti. Many houses in the seaside fishing community lost their roofs and others were completely destroyed when Hurricane Matthew hit – affecting the southwestern part of the country. Despite the call for humanitarian aid to help the 1.4 million people who needed help, many didn’t respond to the call, which was described as ‘a disgrace’ by the head of Concern. Mahouts lead a procession of 11 white elephants past the Grand Palace in honour of Thailand’s King Bhumibol Adulyadej in Bangkok. King Bhumibol died on 13 October after reigning for 70 years, plunging the country into grief and extended mourning. The official mourning period is set for one year. French police officers direct a migrant in the remains of the makeshift migrant camp known as ‘The Jungle’ near the port city of Calais, northern France. French authorities cleared the camp of the thousands of migrants that had settled there in the hope of travelling to Britain. The camp was demolished in the space of a week because structures were deemed unsafe; meanwhile residents were directed to different ‘reception’ areas around France – but it’s not certain if all have arrived. A US-backed campaign to crush Islamic State in its Iraqi stronghold has turned into a gruelling battle – entering its third month of intense fighting. Elite army troops have retaken a quarter of the city, but their advance has been slow and punishing – with reports that members of Isis are using civilians as human shields. President Barack Obama and President-elect Donald Trump shake hands after meeting in the White House after the US presidential election. The businessman’s campaign dominated news headlines and became the topic of 2016 for defying the odds all the way to the Oval Office. Trump, the Time Person of the Year accompanied by his fellow nominee is pictured in a gold elevator shortly after the US election win. A sign of the politics to come in 2017, some analysts say. Trucks carrying the coffins with the remains of Chapecoense soccer team members, victims of an air crash in Colombia, drive through the streets of Chapeco, Brazil. The airline whose plane crashed in Colombia killing over 70 people, including members of the Brazilian football team, was shut down after it emerged the pilot neglected to refuel for the journey. With turmoil in Europe caused by the migrant crisis, the uncertainty of Europe because of Brexit, upcoming elections in member states, and Obama moving aside to make room for Trump, Anegla Merkel is seen as the new leader the free world. Merkel will have her own challenges ahead too. Germany have an election in the new year, and with stiff opposition from within her own party over her ‘open borders’ policy towards migrants, it’s going to be a tough year for Europe. In this frame grab taken from video provided by the Syrian anti-government activist group Aleppo Media Center, a child sits in an ambulance after being pulled out of a building hit by an airstirke in Aleppo – or what is left of it. Email “25 photos of the biggest world news stories of 2016”. Feedback on “25 photos of the biggest world news stories of 2016”.